It has been raining for days. Seriously. Days. There is a part of me that’s sick of it (the part of me that also wonders why I don’t own rain boots or a rain coat! ), but then there’s a bigger, moodier part of me that loves the excuse to stay in. I do my best reading, writing, and baking on rainy days. So this morning I woke to more rain, and as a result, my thoughts quickly turned to baking. I thought about chocolate chip cookies (which I still might make), and I had planned on making this amazing flourless chocolate cloud cake but anyone who knows anything about egg whites knows not to mess with them on rainy days… So what to bake? These Mini Spiced Banana Muffins were just the thing. I had a few neglected bananas because, out of some deeply ingrained habit, I always grab a bunch of them when I go to the grocery store, even though I really don’t love them. I am aware of their health benefits, and they are certainly a convenient breakfast or snack on the go, but I’m just not wild about them. I inherited this from my grandma, I know. Yet, I still buy them and they sit in the fruit bowl until I peel them and freeze them for smoothies, or I bake something with them. Preheat oven to 375 degrees. 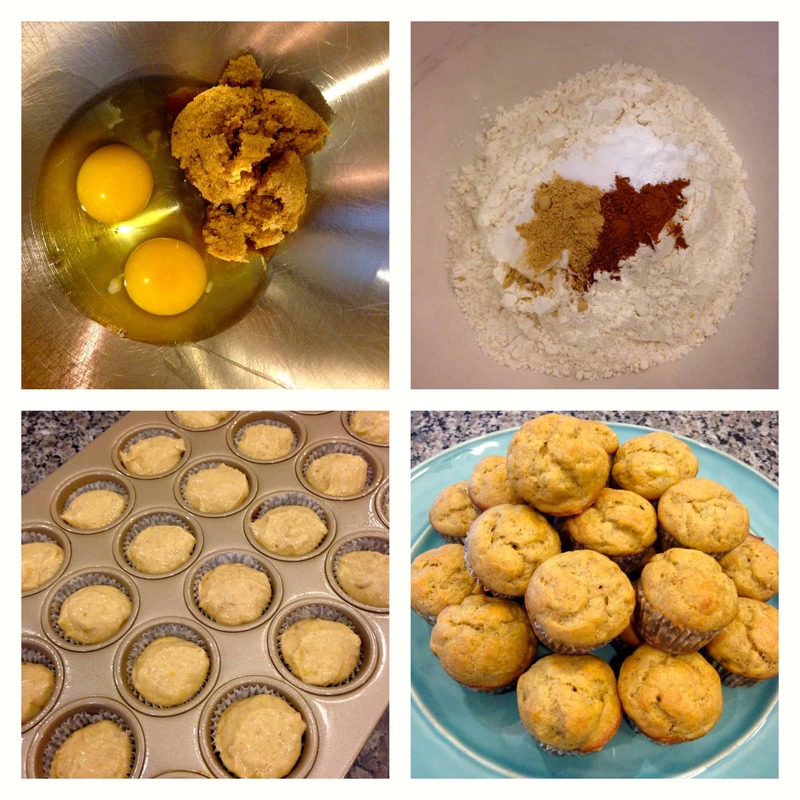 Line 24 mini muffin tins with paper liners, or spray with non stick spray. Combine flour, spices, baking soda, and salt in a bowl and stir to combine. In a separate bowl or mixer, beat eggs, oil, and sugar until thoroughly combined. Add in mashed bananas, yogurt, and vanilla and mix. Slowly add dry ingredients to wet, don’t over mix-it’s ok to still have a few lumps. i love the idea of mini muffins, it makes you feel so much more less guilty ahah. and the recipe looks quite healthy- i will definitely pin it! Thank you! It is pretty healthy… I have made it with half whole wheat flour before too. All whole wheat makes them too dense! You and I are kindred spirits! I forever have rotting bananas in my fruit bowl waiting to become banana bread too! I have no idea why I keep buying them, but it seems like the right thing to do! Another amazing recipe. Never thought about this combination of spices. Can’t wait to make these!